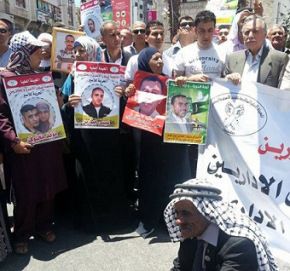 The Palestinian Prisoners Society (PPS) reported on September 14 that Israeli soldiers kidnapped 174 Palestinians in the occupied West Bank, in the second week of September, 2014. The PPS added that most of the kidnappings were focused in the northern West Bank district of Jenin with 69 arrests in different parts of the district. It added that the soldiers also kidnapped 40 Palestinians in the southern West Bank district of Hebron, 12 in Bethlehem, 17 in Ramallah, and 10 in occupied Jerusalem. Four more Palestinians have been kidnapped in the Nablus district, four in Qalqilia, five in Tulkarem, while 13 Palestinians have been kidnapped in Tubas and Salfit, in Central West Bank. There are approximately 7000 Palestinians who are currently held by Israel in 17 prisons and detention camps. Among the detained Palestinians are 75 Palestinians who have been kidnapped after being released under the Shalit Prisoner Swap Agreement. 30 detainees have been imprisoned since before the First Oslo Agreement of 1993; the longest serving detainee is Karim Younis, who has been imprisoned since at least 32 years. They were supposed to be released back in late March, but Israel violated its own vows to release them under the fourth and final phase of releasing all veteran detainees. 1. 477 detainees are serving life terms. 2. 19 female detainees are currently imprisoned; the longest serving of them is Lina Jarbouni who was taken prisoner more than 12 years ago. 3. 250 Palestinian children are still imprisoned by Israel. 4. 500 detainees are currently held under Administrative Detention orders without charges or trial. 5. Six elected former government ministers are still imprisoned by Israel. 6. 36 elected legislators are still imprisoned by Israel. 7. 1500 detainees suffer with various illnesses, and serious conditions, including cancer, heart conditions, and liver diseases, and paralysis. Fourteen of them permanently staying at the Ramla Prison Clinic that lacks basic supplies. 8. 205 detainees died in Israeli prisons since 1967, due to torture, medical neglect, and due to being shot and killed by the arresting officers or while in prison. 9. Dozens of detainees died shortly after their release due to diseases they contracted in prison, and were not provided the needed medical attention.